SNAKE catchers say they are dealing with a “tsunami” of reptiles as temperatures soar on the Queensland Gold Coast and males aggressively pursue a mate. The warning comes after a person was hospitalised following a snake bite and footage surfaced of two male pythons locked in battle on the deck of a Mt Tamborine home on the weekend. 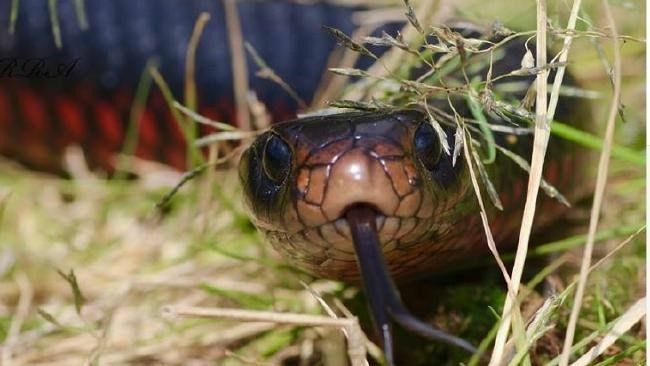 Snake catcher Tony Harrison said he was being called out 10 times a day on average as hot spring weather sent reptile activity into overdrive. “The warmer it is, the more active they are,” he said. “They only get one opportunity a year to meet. “If two boys happen to run into each other they’ll wrestle. Tamborine local Margaret Macleod’s incredible footage of the moment two snakes fought ferociously on the deck of her family home as she and her cat Oscar watched on was shared numerous times on social media yesterday. Ms Macleod said she knew there was a python hanging around her home but said she was surprised to see the snakes going at it on her property. The homeowner said the exchange lasted about five minutes before the snakes moved on. Animal Emergency Service in Carrara principal veterinarian Dr Rod Meehan said he had treated two dogs who had been bitten by eastern brown snakes recently when during winter he would rarely see any. “The eastern brown snake is the third most deadly snake in the world,” he said. “While they’re not a snake that we find goes out of their way to attack ... from our point of view, our patients are looking for them. “They’re very vigilant, some of the dogs. Dr Meehan urged anyone who feared their animals might have been bitten to rush them to the vet.